Here are two dividend stocks that look attractive as 2017 gets underway. 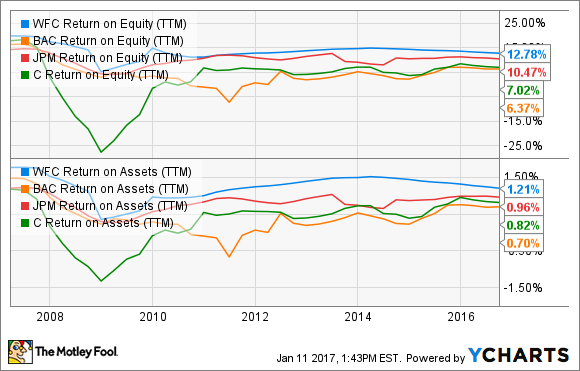 Warren Buffett-run Berkshire Hathaway (NYSE:BRK-A) (NYSE:BRK-B) has a portfolio filled with the stocks of some of the best companies in the U.S. As we head into 2017, here are two examples from Berkshire's holdings that pay strong dividends with room for growth that could be great choices for your dividend portfolio right now. I mentioned in a recent article that one of the investments I'd like to see Buffett and company make in 2017 is to double-down on Apple (NASDAQ:AAPL). Currently, Berkshire's Apple stake is relatively small, in comparison with some of its other stock investments, but I feel it represents one of the best values among all of Berkshire's stocks. Apple is one of my biggest stock investments, and there are several reasons why. First, it's cheap. I know that argument has been overused when discussing Apple, but it's true. At just 13.2 times 2017's expected earnings, the market isn't pricing in too much future growth, but Apple's earnings per share is projected to grow by 8% in 2017 and 12% in 2018. Apple's free cash flow grew 23% year over year in the most recent quarter, and the portion of its revenue coming from services such as Apple Music and Apple Pay continues to climb at impressive rates. Plus, with a massive pile of cash parked overseas and an incoming president who pledged to offer a foreign-profit repatriation discount to corporations, Apple could be on the prowl for value-adding acquisitions in the coming years. In fact, CEO Tim Cook said in September that billions of dollars in foreign profits were already planned to be transferred home in 2017, and that was before Donald Trump was elected. As far as the dividend goes, it's completely understandable that Apple's 1.9% yield doesn't get many income seekers excited, but it's important to realize that the current payout represents just 28% of Apple's trailing-12-month earnings. This means that there is a lot of room for the dividend to grow, and Apple has made it clear that it intends to increase its dividend every year, which it has done at an impressive 10.7% annualized rate since it started paying dividends in 2012. Wells Fargo (NYSE:WFC) is one of Berkshire's largest stock investments, with a stake valued just shy of $26 million as of this writing. It is one of the best dividend payers in the banking industry with a yield of 2.8%. The bank was also among the sector's worst performers in 2016 -- rival Bank of America rose by 33% and U.S. Bancorp rose by 20%, while Wells Fargo managed to increase by a paltry 1.4%, mainly due to its fake-accounts scandal that was revealed in September. Wells Fargo has experienced a considerable drop in new accounts and customer confidence in the months that followed, but it's unclear how much of a lasting impact the scandal will have once it becomes more of a distant memory. About two months after news of the scandal broke, Buffett said that he had not sold a single share of the bank, nor did he plan to. This caught many people by surprise, as Buffett has been quick to get out of investments in the past when he felt a company's reputation was compromised. While Buffett acknowledges that the scandal and the incentive system that caused it were big mistakes, he calls the bank an "incredible institution." When it comes to Wells Fargo, Buffett simply believes the good outweighs the bad, and I'm in complete agreement. The company took appropriate measures to learn and recover from the scandal, including leadership changes, termination of its unhealthy sales culture, and firing the 5,300 employees who participated in the wrongdoing. The bank remains the best of the "big four" in terms of asset quality and profitability. It has earned consistently better returns on equity and assets than peers, and there's no reason to believe the fallout from the scandal will change that. Warren Buffett has famously said that "our favorite holding period is forever" in reference to Berkshire's stock investments. Of course, Buffett doesn't hold all of his stocks forever -- in fact, Berkshire sells stocks all the time. If his reasons for buying a stock no longer apply, or if there's some other reason he's no longer interested in a stock as an investment, Buffett is completely willing to cash in his chips. The point is that you should approach these investments as if you're going to hold them forever. Buying high-quality, dividend-paying stocks is perhaps the most certain path to wealth you can take, so buy these with the long haul in mind.